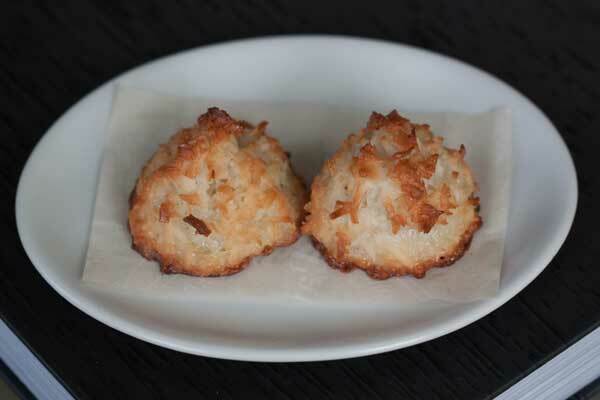 I love Condensed Milk Macaroons and Chewy Chocolate Macaroons , but I have a new favorite — Giant Coconut Macaroons. Giant Coconut Macaroons do not call for condensed milk. Instead, they’re made with egg whites, sugar, coconut and a couple of extracts. In addition, they have a chocolate drizzle. It’s optional, but I recommend it! 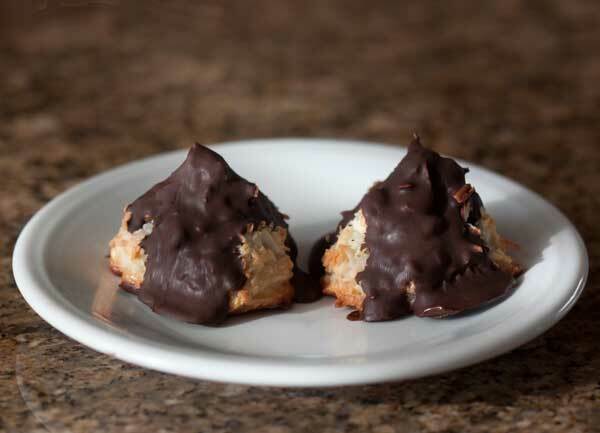 Giant Coconut Macaroons like you see in bakeries are made with a two-step process. You mix and heat the ingredients to make a coconut sludge, chill it for an hour until it thickens, then shape. I shaped mine into rather tight clumps and they expanded a bit as they baked. You could also try shaping into pyramids or other structure, and of course you can always make these smaller. Either way, this recipe is a lot of fun and you can use the leftover egg yolks in cracked sugar cookies. Giant Coconut Macaroons like the ones you see in bakeries. These macaroons do not use condensed milk, but are made with egg whites, sugar and coconut. In a 3 quart heavy saucepan, stir together the sugar and egg whites until very well mixed. Add the coconut and stir until coated with egg white mixture. Set the mixture over medium heat and cook over medium, stirring often with a wooden spoon or silicone scraper, until mixture is shiny and syrup begins to form. This should take 7 to 10 minutes. Remove from heat and stir in the extracts. Empty the mixture onto a parchment lined baking sheet or a couple of parchment lined plates and put in the refrigerator to chill. Let mixture for about an hour or until cold. Preheat oven to 325 and line a large baking sheet with parchment paper or nonstick foil. Shape the cold coconut mixture into 8 large, tight mounds and arrange about 2 ½ inches apart. Bake for 25 to 30 minutes or until mounds are golden. Allow them to cool for about 20 minutes on the baking sheet, then carefully remove. If you're interested in dipping them in chocolate, coat about 1/2 cup chocolate chips with a little coconut oil and melt on medium heat in the microwave, stirring ever 30 seconds. Dip or drizzle over macaroons. Heidi, HAL says thanks for asking about him! Both dogs are fine and seem to be enjoying city life. Thanks for the tip on the Disney macaroons. The ones I made are mountain shaped and the texture is dense and chewy like a Mounds bar but with crispy edges. I’ll have to try the Disney ones, though. I don’t eat a lot of macaroons and haven’t tried a very wide array of textures. I am intrigued! This seems really unique for homemade macaroons! I can’t wait to try them! I’ve been meaning to ask you what ever happened to your cute dog Hal? I haven’t seen any pics of him or even heard you mention him. How is your corgi, Lizzie? So what is the texture of these macaroons? I’ve never cared the for texture of the condensed milk recipe. You know which macaroons I remember above all others? The big mountain shaped ones they sell at Disneyland at the little bakery near the main entrance. I LOVED those macaroons and could never duplicate the texture. I can’t even describe the texture but it wasn’t super chewy or moist. I’m trying to find the words to describe them but I can’t. I just loved them though and ate them everyday when I was down there! I’m hoping the recipe you just posted was similar. They look delicious! I’ve made these smaller, but the pyramid shape looks even tastier, for some reason!